Whether you are a professional or an amateur, it is not undeniable fact that tile lippage is an annoying problem. Even a single tile that has an uneven setup is capable of ruining an entire task. Sometimes, such small flaw will render you with no choice but to go back to square one. For contractors and hobbyists who want to tile efficiently and adequately, investing in the best tile leveling system is necessary. This is the only tool out there that is capable of assuring you that tile lippage will never occur throughout the entirety of your project. Tile leveling systems also optimize the speed and efficiency of your work, allowing you to save time and money. On the other hand, tile lippage does not just cause a depreciation in the aesthetics. It is not just about the irregularity of the placement of the tiles. Professionals want to avoid committing this error because it can cause multiple tripping hazards. At some point, such accident can be deleterious, especially if the involved person is a child or an elderly. Despite being a straightforward tool, a tile leveling system is deemed highly necessary. It enables you to arrange your tiles seamlessly, and at the same time, quicken the pace of your project. You will never regret if you invest in this amenity, even if you are not planning to use it frequently. For your convenience, I listed here all the top-rated tile leveling systems in the market today. See which one of them can actually benefit your needs and requirements. How Can a Tile Leveling System Fix the Problem? It is already cemented that the Perfect Level Master T-Lock KIT is one of the finest tile leveling systems in the market today. This one can guarantee that the tiles you are going to install will be leveled properly. With this kit, you will never see or feel any irregular and uneven placements of tiles. The Perfect Level Master T-Lock Kit is also capable of preventing tiles from being warped while your thinset is curing. Warping tiles are pretty standard if you don't have a functional leveling system to help you out. Aside from this, this amenity improves the process and speed of laying tiles. It is an expected outcome as you are moving away from the traditional means of placing tiles. Once you implement the use of this tile leveling systems to your projects, you can always assure that you can achieve your desired results. You don't have to become a professional just to reach the level of perfection that you want for your tiling projects. The Perfect Level Master T-Lock system is usable in both professional and DIY applications, which makes it extremely versatile. The Raimondi Leveling System Starter Kit is one of the most trustworthy tile leveling systems that I have tried. It is exceptionally ergonomic, as all the essential tools that you need to keep your tile straight and flat are included in this kit. Many professionals and DIYers that have used this tile leveling system can attest its proficiency and simplicity of operation. It won't cause major headaches to you at all. 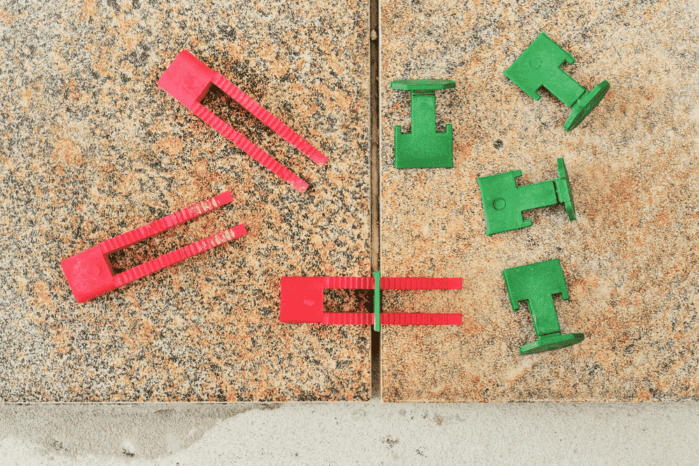 Specifically, the kit can provide you one tile floor installation plier, one hundred (100) reusable wedges, and one hundred standard spacer clips. It can give an accurate 1/16-inch spacing between tiles, which is excellent for various tiling applications. Take note that removing and placing the leveling spacer clips are pretty straightforward. That's the kind of efficiency that you can experience if you are going to use this tile leveling system. I have also noted that the leveling spacers of Raimondi have a newer design. The appearance of the spacers of this brand is not like this a couple of years ago. Of course, the change was for the improvement of the tiling process. They have prevented any height variance and defects in the aesthetics of the tiles. It also stops the tiles from warping whenever the adhesive starts to cure. This one is the best choice for DIYers and hobbyists. The Yaekoo Tile Leveling System provides the basic items that are needed for leveling your tiles. It has an entry-level price, which indicates that it is for small-scale and straightforward applications. However, I have noted that this package gives you 600 tiles leveler spacers. That is pretty hefty if you ask me. This tile leveling system can ensure a leveled construction and placement of tiles. It can be used for either horizontal and vertical placements without any hassle. Because of the ergonomic design of the tile clips and wedges, the system can hasten the speed of tile installation. Of course, that just means that the stress and fatigue that you should feel will be curbed down drastically. After using this tile leveling system, I was quite surprised that it was able to produce lippage-free results. The surface is very flat and doesn't have any virtually noticeable flaws. The system is also handy in preventing the tiles from moving while the adhesive is still curing. Overall, I have no qualms about using this amenity. The Peygran Tile Leveling System is a professional-grade option. In fact, many contractors claim this kit as one of the most innovative leveling systems for tiles in the world today. I examined the quality and performance of the package, and honestly, I was really blown away. From its simplicity down to its efficiency, this tile leveling system is almost peerless. Every project that it works turns into wonder. It can render any floor surface slippage-free. Not a centimeter of difference can be seen when this tile leveling system is applied. It can also lessen the time and effort that you need to install your tiles because it is very easy to use. Whether you are tiling a floor, ceiling, or wall, the Peygran Tile Leveling System Kit is usable. Aside from creating seamless flatness, the leveling system prevents the tiles from wobbling throughout the mortar procedure. It also inhibits the warping of tiles while the thinset or adhesive is curing. Since the clips, wedges, and pliers are made from Spain, you can assure that they are durable and reusable for countless times. Therefore, they are the ideal choice for professional contractors who want a set of reliable tile leveling tools on their arsenals. Just like the rest of the tile leveling systems here, the Wang-Data ensures a lippage-free placement of your tiles. As I have heard, this system is only new in the market. But the performance and results that the kit provides are undeniably good. Even it is still the new kid on the block, it has already received the commendations of many DIYers and some professional contractors. The clips and wedges that are included in this package are noticeably large. They are perfectly suitable for any tile materials that have 3mm to 12mm thickness. Meanwhile, it is indicated in the kit that the smallest part of the left seam is 1/17 inch or 1.5mm. The setup process of the Wang-Data is pretty smooth and hassle-free. You can level it properly without the need of undergoing quirky procedures. It can keep the even placement of the tiles during the adhesive or thinset curing. I have also noticed that the white and orange colors of the clips and wedges make them easy to work them. They can provide a stark contrast, which allows you to see them even in low visibility settings. Another advantage of using the Wang-Data Tile Leveling System is its generous pricing. It is not as costly as other systems, making it an excellent option for people who are staying frugal, no matter what. I have mentioned the term tile lippage in this article many times already. But it seems that it is still a foreign term for the most of us. Well, the best tile leveling system is created for the purpose of preventing tile lippage from happening. 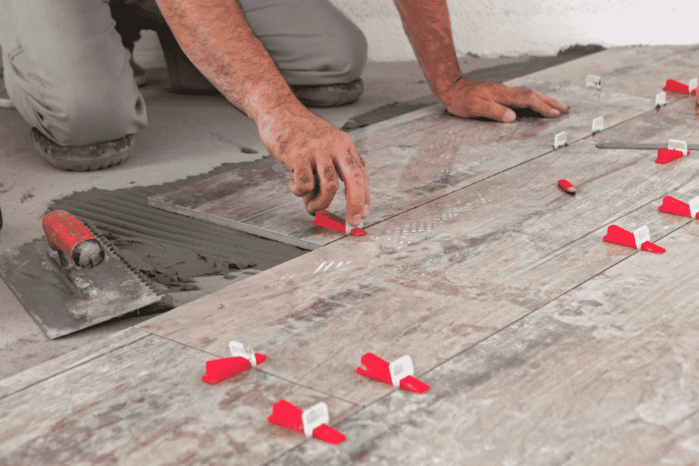 After all, a lot of DIYers--even those that have experience in flooring and walling applications--still assume that tiling is a straightforward process. But once you start the project, you will eventually realize that it is downright straining and difficult. If you can't arrange and place the tiles properly, tile lippage can occur. The latter is the result of putting tiles at uneven levels. Specifically, I can describe it as the displacement of tiles at a vertical degree. Usually, it happens on the edges where two tiles meet. Furthermore, tile lippage can happen even if width spacing of the tiles are even and proper. As long as there is a difference in the height of their placement, tiles are always susceptible to lippage. Lippage on tiles doesn't just ruin the appearance of a supposed-to-be beautiful floor or ceiling. Albeit to the knowledge of many, tile lippage can branch into multiple problems. First, it is the leading cause of tile damage. Since there's one part of the tile that is slightly protruding to the surface, it is susceptible to being hit and stepped on by various objects. Even your feet could break or crack the tile if you stepped them forcibly. Another problem that tile lippage can cause is tripping hazards. Small children and seniors that are using walkers are in danger of toppling over just because of the uneven placement of tiles. If you are a flooring contractor, you will be held responsible for the possible repercussions of such accidents. But always take into account that not all tile warping is considered as tile lippage. In the assessment of the American National Standards Institute, there are certain levels of tile lippage that are allowable. For grout joints that have a width of 6mm or less, the permissible lippage should not exceed 1mm. Meanwhile, for grout joints that have a width of 6mm or more, a 2mm lippage is pretty acceptable. The default warpage of the tile is already included on both of those two specifications. Of course, tile lippage can happen because of different factors. You can always blame first the flatness of the surface that you are working on. Sometimes, this happens due to the wrong application of thinset or adhesive. If the ground or surface of the floor doesn't have depressions or peaks, placing the tiles accurately and adequately should not be a problem. But there are certain instances in where tile lippage can still occur even the desired conditions are given. One of the primary reasons for this is the irregular or varying thickness of the tiles. If that's your predicament, then a tile leveling system can help you out. This is the tool that you are going to need if you want to make sure that your tiling project will be free from error. In fact, I do recommend that you use this amenity every time you are going to undertake a wall or floor tiling task. Practically, tile leveling systems work the best when they are handling large tiles. Because of their given design and setup, tile leveling systems are capable of interlocking tile pieces. As they do this task, there is a guarantee that the tile surface will remain flat while waiting for the thinset or adhesive to dry. The interlocking mechanism of tile leveling systems doesn't not only reduce the chances of tile lippage from happening. It can also minimize shrinkage from happening. Furthermore, it is notable that these systems cut down the time needed for tile installation significantly. After all, with tile leveling systems, there's no need for you to lift the tiles if you are going to place additional thinset. You cannot call a unit as a tile leveling system if it is missing one of these three essential components: clips, wedges, and pliers. These three items are working together in harmony to ensure the flatness and smoothness of your tiles. They can stabilize the arrangement and placement of the tiles while the thinset is curing. The clips are the ones that hold the tiles together. They clutch the edges of the tiles on a flat and uniform level. In this way, you can secure the flatness of the surface without even trying hard. You are going to place the clips while you are placing the tiles. The clips should be attached to the edges of the tiles. If the system that you have is too small for the tile that you are working on, you need to place the clips along or on the edges. Meanwhile, larger clips can be affixed to the center of the tiles. Take note that bigger tile leveling systems need the assistance of special hand tools. Once you have attached the clips, you can already put the wedge under the opening that the clip has made. The pliers will enable you to crimp the setup. If the clip and wedges are small, you can manage them by applying finger pressure. After this, you can let the grout or thinset dry in the process. Remember, you must no remove the wedges and clips throughout this period. You can take them out once the grout is dried. Simply kick the upper parts of the wedges out. The latter would eventually break under the adhesive, considering that they are made with quality. If you can do these steps properly, the tile floor that you have is virtually flawless. Meanwhile, you have to consider the quality of the pliers as well. Make sure that it has an ergonomic construction. Specifically, the handles of the material should be made from the combination of two or more materials. Such specification would make them safe and lightweight. But of course, synthetic handles will make the pliers durable and sturdy. Tiling projects require extreme precision and accuracy. It can never be done carelessly; otherwise, you will up for a bad time. After all, nobody wants to see tile lippage protruding anywhere in the surface of your floor or ceiling. That's not a sight that you want to see, and it can become a potential hazard. The best tile leveling system can prevent this problem from happening. Just like what we have discussed, this amenity ensures that all the tiles you place will be even and flat. Among all the options that I have listed here, the Perfect Level Master provides a stable and accurate performance. It can be used on large-scale projects. Using its clips, wedges, and pliers are pretty easy. Investing in this tool would never be a bad idea at all. That's all for now! If you have some questions, feel free to ask me in the comment section below!